Foil has many uses. But, one of the most intersting, easy and surprising uses is for sculpting! 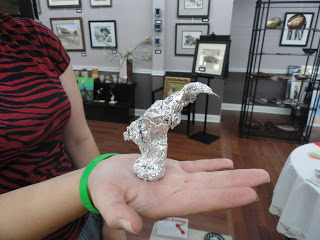 can think of, can be created with a piece of foil. …and create to your heart’s desire. School- age kids and Teens (yes, teenagers!) seem to really love this activity. a bracelet topped off with a “rose”, made by a teen girl. Modeling a bracelet, with a “dove” sitting in the front and a “flower” in the back. This boy couldn’t wait to see if his “boat” would float! Wishing you lots of foil fun! A Piece of Paper Magic!